So i know that the whole world is obssesed with Ray-Ban's at the moment, and i hate it when i love something that everyone else is wearing... but i can't help myself. 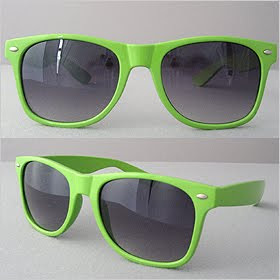 I'm in love with the Ray-ban Welfarer sun glasses, specificaly the coloured ones. Now the pic above is a Ray ban inspired version, but i'm sure you know what i'm talking about.